His Majesty The King graced the last day of Paro Tshechu yesterday. His Majesty offered prayers before the Guru Thongdrol, which is unfurled on the final day. His Majesty joined the people to view the Tshechu, and met with thousands of people gathered there. Among those attending was 12-year-old Kinley Gyaltshen, who has attended the Paro Tshechu every year since 2012, to meet his King. Kinley was delighted to greet His Majesty once again. Holding a framed photograph of Their Majesties close to his chest, a gift from His Majesty, Kinley left home. This year an additional Thongdrol was unfurled from the Utse of Paro Dzong. It was unfurled to mark the significant events, the Royal Birth of His Royal Highness The Gyalsey, the 400th anniversary of Zhabdrung’s arrival to Bhutan and the birth year of Guru Rinpoche. The Thongdrol is the largest in the country. 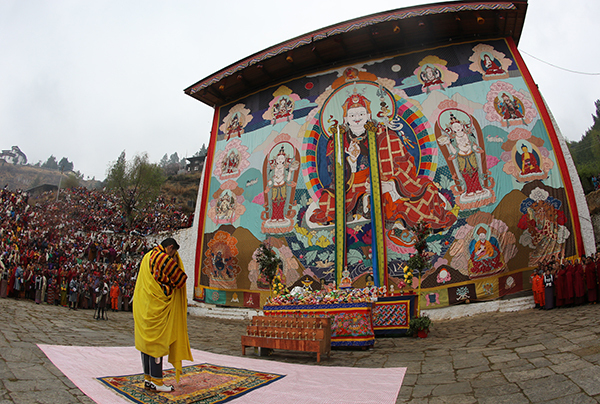 Paro Tshechu is held for five days annually. The highlight of the last day of Paro Tshechu is the unfurling of the Guru Thongdrol. It is exhibited for few hours at daybreak on the final day of the festival enabling people to obtain its blessing. Paro Tshechu started on Saturday.